PROVIDENCE — The Coastal Resources Management Council (CRMC) is considering an application that proposes to fill in a section of the Seekonk River in the city’s Fox Point neighborhood to build a bike path along the river’s edge. The application was submitted to CRMC by the Rhode Island Department of Environmental Management in cooperation with the Department of Transportation. 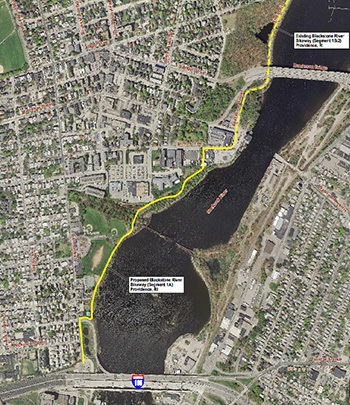 The bike path would be a part of the larger Blackstone River Bikeway, which already connects the communities between Providence and Woonsocket via a network of on- and off-street bikeways. Currently, the Blackstone River Bikeway approaches India Point Park via Pittman Street and Gano Street, high-traffic streets that some bicyclers find intimidating. "The Blackstone River Bikeway has always been intended to be a route separated from motor vehicles, just like the 10 miles of trail in Lincoln, Cumberland, and Woonsocket," said Eric Weis, Trail Program Coordinator for the East Coast Greenway Alliance. Weis said he expects the bike path will be used by cyclists who prefer to be off the streets and local children who need safe routes to playing fields and playgrounds. According to the public notice released by CRMC, the proposed bike path’s southern terminus would be just north of the westbound exit ramp of I-195 on Gano Street. From there, it would travel east toward the river, then north along its bank. The path would cross the neighborhood’s new boat ramp and pass through Gano Park, currently developed for a variety of recreational uses including sports, gardening and dog walking. The path would continue over the abandoned railroad tracks leading to the decaying Crook Point Bascule Bridge, then behind the strip mall that houses East Side Market Place. The path would eventually turn east and travel along a shoulder of Pitman Street, until reaching the rotary that connects it with Waterman Street and East River Road near the Waterman Grille. The path would then continue on an already-established bike route that travels through Blackstone Park. The project will require the filling of tidal waters for a 75-foot-long section of the bikeway, resulting in about 2,500 square feet of fill in the Seekonk River, according to the public notice. The area proposed to be filled is just north of the I-195 exit ramp. Weis said he hopes an off-road alternative to filling the river will be found, such as a short boardwalk or an agreement with the adjacent property owner to grant the bikeway passage across his parcel. Members of the public have the right to object to the project and request a hearing. The deadline to request a hearing is Feb. 7. A yet-to-be scheduled public hearing also will be held, according to CRMC. A future project will continue the bikeway off-road alongside Gano Street into India Point Park, according to Weis.